Sanuki udon is made daily at this cute udon shop tucked in the alley between Lao Yo Ji and Rakumenya Ramen. Opened in May 2012, Fu Yu Wu Sanuki Udon takes over the corner that used to be Kitaro. 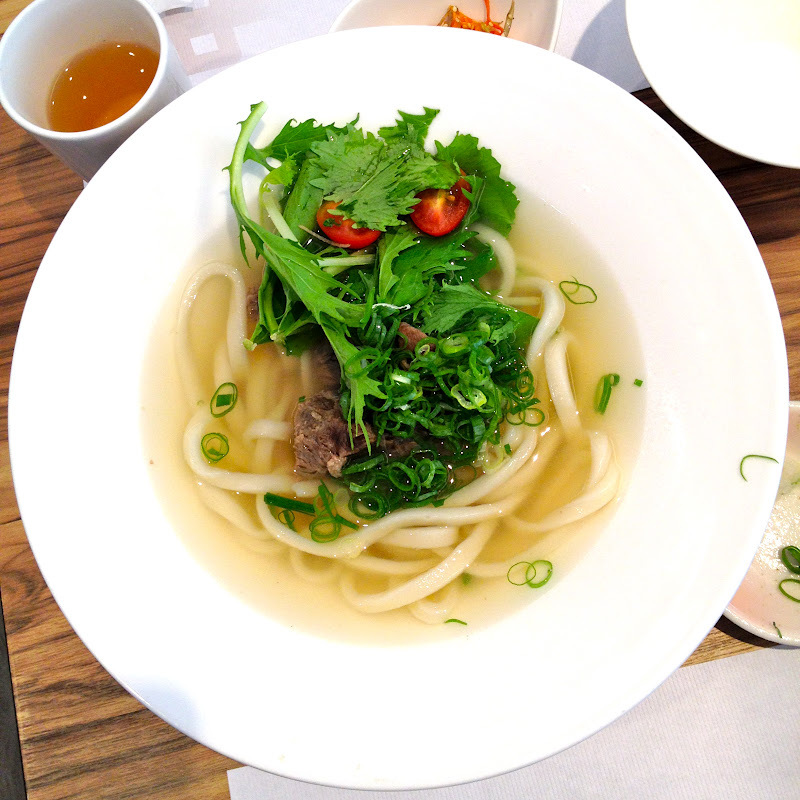 I haven't had good udon since my previous Xinyi District favorites Jika Udon and Tenpura Sanuki Udon had closed down. So I was pretty excited to try this with my cousin. The open dining room has seating mostly for couples and small groups, and is brightened by the distinctive graphic patterns decorating the columns and walls. Looking over the menu, we kept talking about how we could bring our dads (or my grandma) here. It was also a good sign that the customers behind me were speaking Japanese. 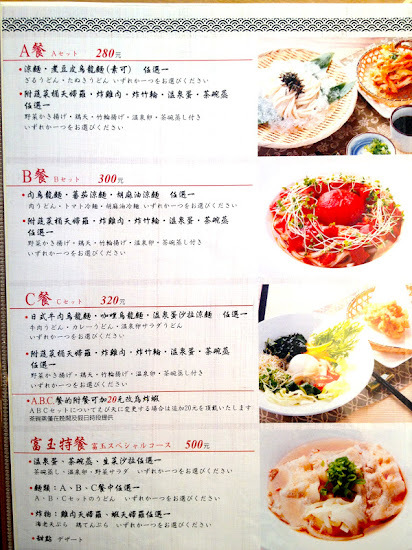 The menu is only in Chinese and Japanese (unfortunately no English menu), but has photos of their prime attractions- the bowls of hot and cold udon. The sets run from NT$280-500 with the options of ordering ala carte or pricier hotpot, as well a business lunch set at NT$180. 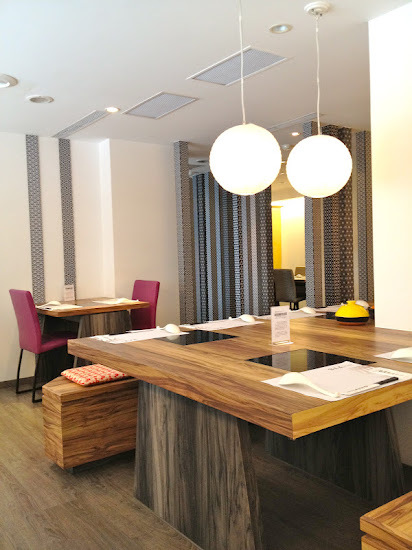 With each set, you get a choice of appetizer (steamed egg, soft poached egg, tempura or salad), udon and on weekdays, they include dessert. There are some distinct cold udons, including one in a sweet tomato bonito broth, and about four different hot variations to choose from. 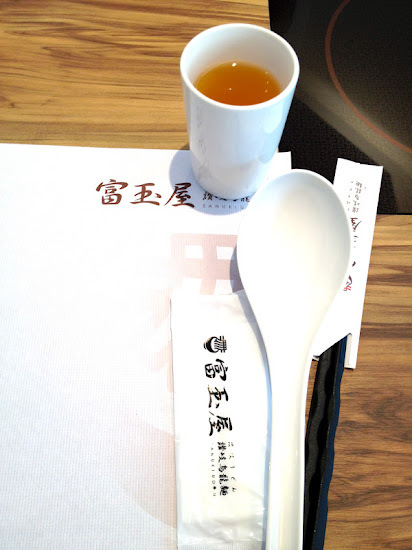 We were hungry so we decided on sharing two of the NT$500 sets, which allowed us to pick udons from any set and get full sized shrimp or chicken combo tempuras, as well as an appetizer and dessert. Giant spoon to help you get your noodle on later. A small bite size starter arrives promptly- the first day was sweet burdock slivers. Another day a small cube of sauced cold tofu. 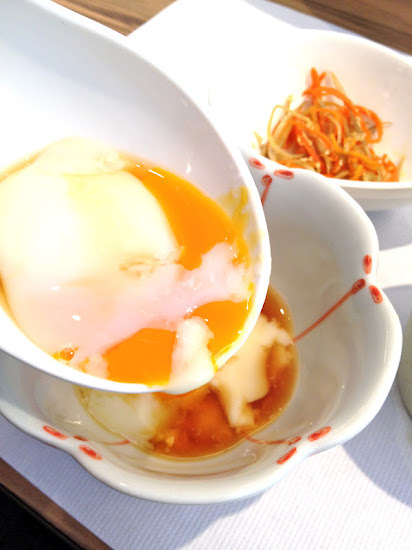 Set menu appetizer options are steamed egg (chawanmushi), soft boiled egg or side salad. 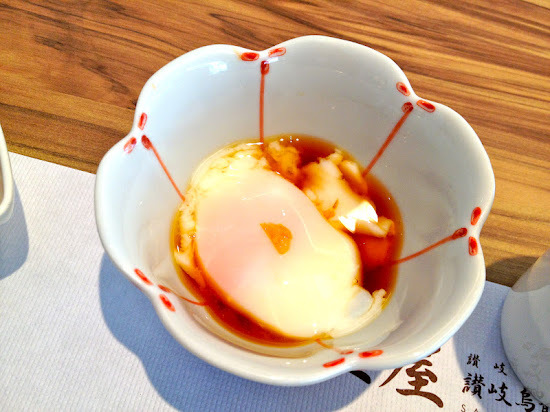 Give me a soft boiled poached egg anyday! 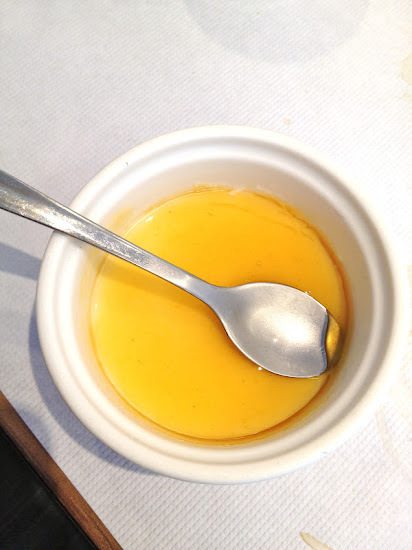 I thought about dipping my udon in this and mixing it up, but I ended up just enjoying the lightly sauced slippery egg in a few slurps. The cold udon came out first, long strands tangled atop a light woven basket. 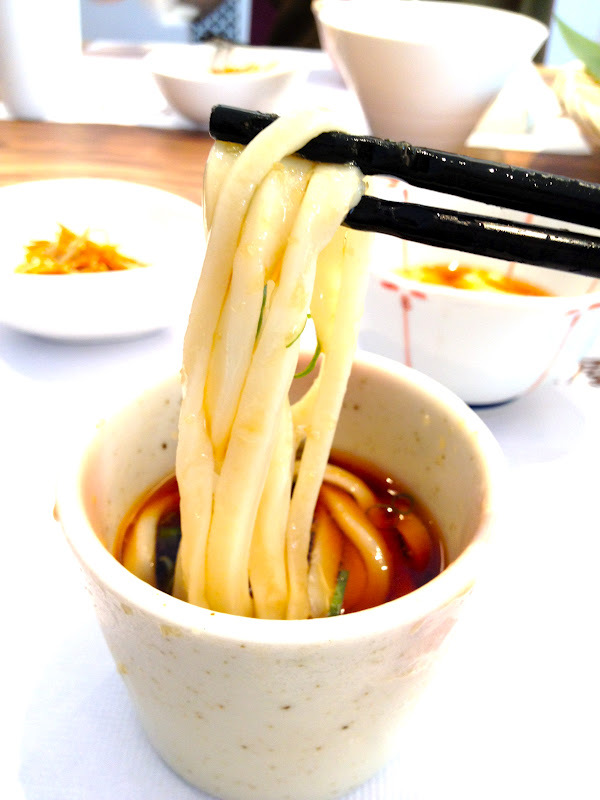 Loved the chewiness of the cold udon at the first bite. Too bad it didn't come on ice like the photo, but it was still very QQ. 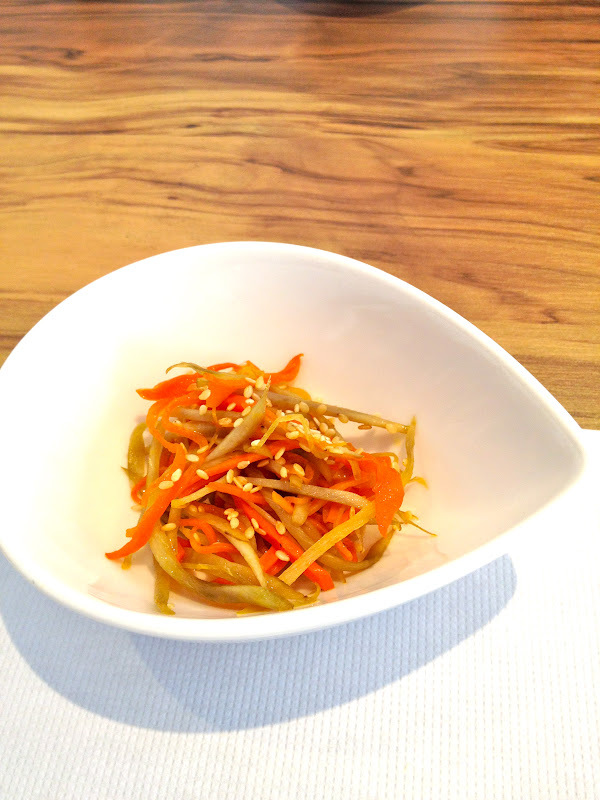 The dipping soy sauce comes with chopped green onions and grated radish and tiny dash of ginger. It would have been nice to have a tad of wasabi too as a choice. 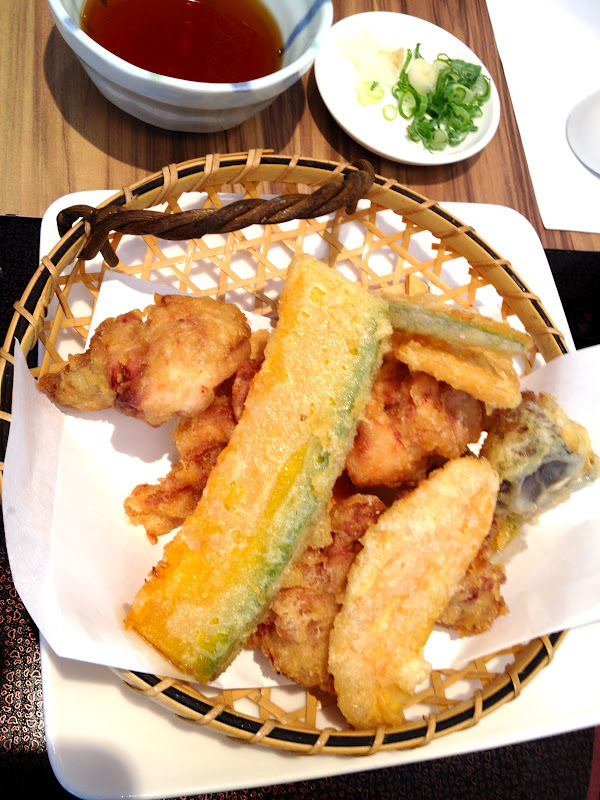 The NT$500 set that we ordered came with a choice of shrimp and vegetable tempura or fried chicken with vegetable and we ordered one of each to share. 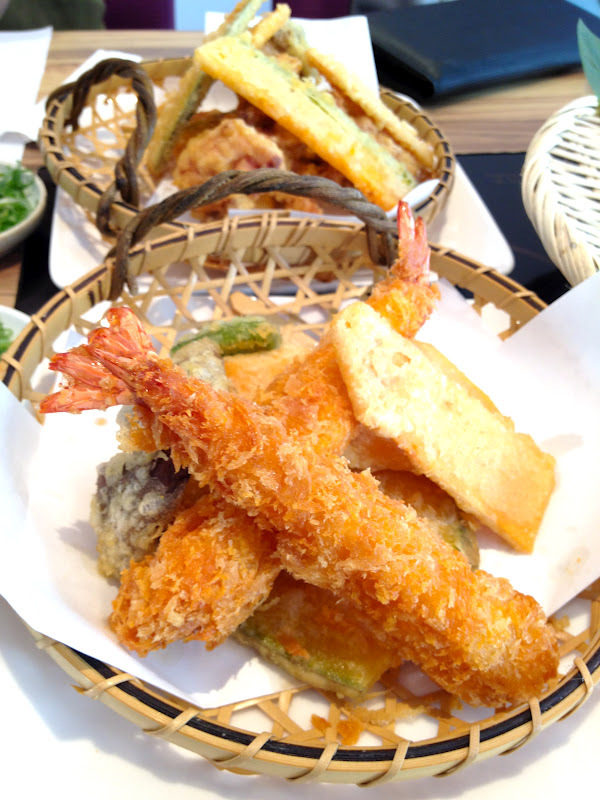 Super crispy and hot, the shrimp had panko crumbs while the vegetables had a sheer coating for the tempura. So good! I was surprised to see the Japanese beef noodle udon that my cousin ordered was much like a Taiwanese style clear broth beef noodle soup. The flavor was good, but very light and the noodles were quite soft, bordering on mushy, in contrast to the al dente chewiness of the cold noodles. We did eat the cold noodles before touching the hot noodles, so it's possible that the noodles absorbed too much soup while we were busy. I preferred the cold noodles over the beef noodle soup since the soup noodles were much softer and the beef was a tad tough. I didn't finish my half of the bowl. Next time I'd probably try the curry udon or the pork slices instead for a hot udon or the salad cold udon. So crispy. Crunch crunch. Devoured. Half a mushroom, plenty of sweet potato and pumpkin and four pieces of fried chicken. The set dessert was a small panna cotta with what I thought was the typical caramel sauce, but was actually a refreshing peach flavor. I came back a week after my first visit and tried the cold tomato broth udon (NT$300) with the vegetable tempura cluster, or yasai kakiage. There was actually a lot of crunchy slivers of vegetables woven into the compact deep fried goodness. 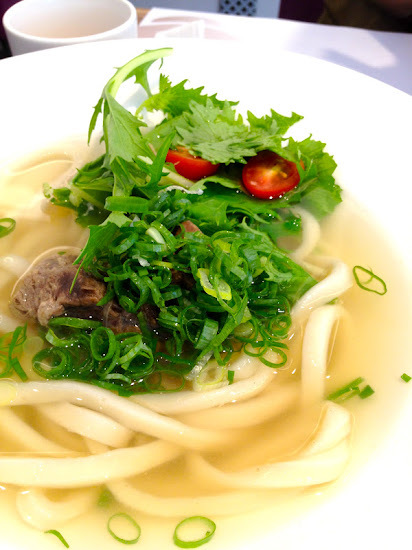 And at first bite, my tastebuds didn't know what to do with the sweet, cold, tart flavors of the tomato broth udon, but the bowl was a surprising joy to eat. Long time lurker, first time commenter: this restaurant looks awesome. Is it lunchtime yet? Please reply so that we could talk further on Link Exchange. 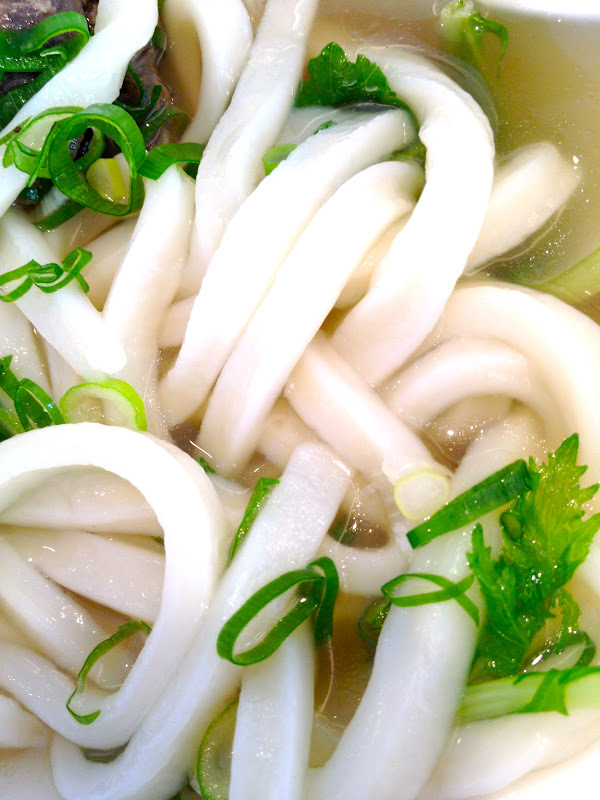 SANUKI UDON is the best! There's a tiny five seater, hole-in-the-wall SANUKI shop in Tokyo (DAIMON 大門) that's cheap and unbeatable! yummmy! the beef noodle soup looks so pretty!